The Detroit Assurance camera system tracks the truck’s position within its lane markings. Facing the road, never the driver, the camera system offers an additional layer of assurance and peace of mind. Available as an optional addition to the radar system on every Freightliner Cascadia® model, the camera system includes Lane Departure Warning (LDW), a feature that tracks the truck’s position and sounds a warning when an unintentional lane change is initiated. A windshield-mounted, forward-facing camera detects the road's reflective paint and it's lane markers. If the truck crosses them without using a turn signal, the radio is muted, and an audible warning is sent through the speaker on the side of the truck that crosses the marker. This audible warning is accompanied by a simultaneous visual warning in the driver dashboard display. The optional Bendix AutoVue® camera continuously records video of the truck's activity, capturing any severe collision-mitigation events. It continuously records a total of 20-30 seconds of recording, along with other driver performance data. This is transmitted to the SafetyDirect web portal for fleet operators and safety personnel to download and analyze. 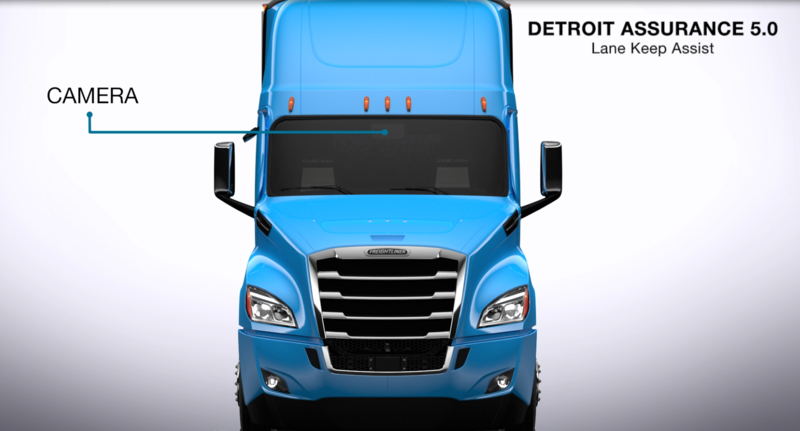 In the new Freightliner Cascadia, a lane departure switch, that fully disables LDW, is available on the instrument panel. Detroit Assurance 5.0 includes an optional driver facing camera which provides insight into driver’s actions before, during and after an ABA event. Viewable via the optional Bendix Safety Direct portal the footage can be used for driver training purposes. Learn more by visiting your nearest Freightliner dealership.